What will the year ahead bring for Australia? 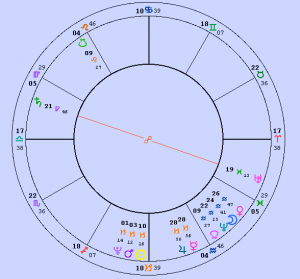 With a horary chart like this one – actually it’s an event chart but never mind – it’s best to pay attention to the angles. Libra on the ascendant for Australians means a year of dealing with partnerships and allies. Aries on the descendant brings a focus on war around partners. I think Iraq and bringing home our soldiers will be a huge focus. This is reinforced by The Sun in Capricorn at 10 degrees exactly on the nadir. Cancer rules the fourth house of home and is the exact reverse of Capricorn. There will be a public bringing home (to the fourth house) of those who are away. Capricorn on the nadir will probably also keep the focus on business and the economy at home. Australian exports may do surprisingly well, considering this is a global crisis. Mercury conjunct Jupiter – expect a lot of news around media plus travel by our politicians. Again, allies and partners overseas may cause a lot of discussion. I always look for a rule of three, and we have it here (Sun on Nadir, Mercury conjunct Jupiter, Libra ascendent). Anyone else fed up with Saturn oppositie Uranus yet?